The Bad Guys! Set #1 Garden Pests is a set of 32 laminated cards with color photos and concise descriptions of insects and other organisms that can cause damage in the home vegetable, fruit, and flower garden. Proper management to minimize damage is suggested. These cards are designed to help home gardeners learn to identify the bad guys—common vegetable and flower garden pests. The photos and information on each card provide sight identification of the organism or group of organisms considered, and the type of damage it causes. Proper identification of garden pests is necessary to choose the correct management methods. Nonchemical management recommendations are provided. For proper chemical controls and timing, check with your local Extension office. Note that a bar on most photographs approximates the organism's size. The Bad Guys! Set #2 Landscape Pests is a set of 32 laminated cards with color photos and concise descriptions of insects and other organisms that can cause damage in the home landscape. Proper management to minimize damage is suggested. 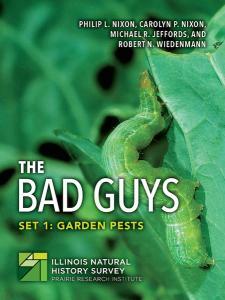 These cards are designed to help home gardeners learn to identify the bad guys—common landscape pests. The photos and information on each card provide sight identification of the organism or group of organisms considered, and the types of damage they cause. Proper identification of landscape pests is necessary to choose the correct management methods. Nonchemical management recommendations are provided. For proper chemical controls and timing, check with your local Extension office. Note that a bar on some of the photographs approximates the organism's size. The Ugly Guys! 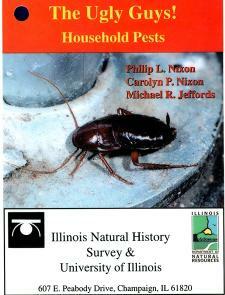 Household Pests is a set of 32 laminated cards with color photos and concise descriptions of insects and other organisms that can become pests in the home. Proper management to minimize damage is suggested. These cards are designed to help residents learn to identify the ugly guys—common household pests. The photos and information on each card provide sight identification of the organism or group of organisms considered, and the types of damage they cause. Proper identification of household pests is necessary to choose the correct management methods. Nonchemical management recommendations are provided. For proper chemical controls, check with your local Extension office. Note that a bar on some of the photographs approximates the organism's size. Forest Quality Indicator Sheets: are laminated sheets with color photographs, line drawings, and concise descriptions of organisms that can be used to estimate the quality of forest habitats in Illinois. 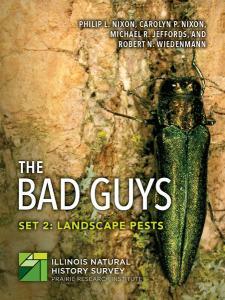 These were developed for ForestWatch program of the Illinois EcoWatch Network. They are particularly popular with school teachers. The Illinois EcoWatch program has been discontinued so these cards are only available while supplies last.